Let us spec and procure your desktop pc's, and we can make sure you have the latest and most reliable available at the best price. Here at GHS we can provide any manufacturer of desktop pc you require, but as a Dell reseller we can leverage best pricing on great quality pc's. 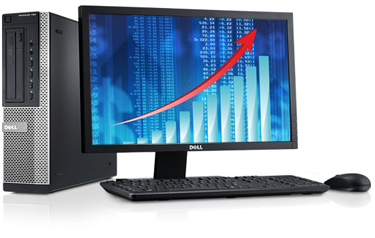 We are currently recommending the Dell Optiplex range as a great all round business pc. Look no further than the OptiPlex for an outstanding return on investment. This affordable desktop solution comes ready to work, providing your office with essential standard office productivity. Get the job done with the efficient OptiPlex desktop featuring the latest generation Intel® Core™ processor family.